A quirk in Michigan case law makes it possible for a land speculator with deep pockets to force a change in local zoning rules that forever squelches any meaningful public participation. And it nullifies -- again forever -- local ordinances. Yes, "forever" is a strong word. Let me explain why it is so apt. First, a reminder: Michigan boasts more coastline than any other state besides Alaska and a dramatically friendlier climate. People from places without coastlines or with crowded coastlines see our shorelines as pure gold. People want to enjoy the golden sands and sunsets. And there are people who want to enjoy the wealth they can generate from those beaches. Here's where the case law quirk comes in: A developer doesn't submit plans or engage with the local government in the usual way, but instead makes a variety of accusations designed to move the matter, as quickly as possible, into court. Local zoning, a legislative matter, is removed from the legislative process and, immediately, things get very expensive. Our small local governments are not equipped to respond effectively to such tactics. And while the Michigan Supreme Court has not had the opportunity to weigh in on any such cases, some judges have recognized that zoning by consent decree raises an important separation of powers issue. At the heart of all this are 400 acres of Lake Michigan dune land in SaugatuckTownship. This area has been zoned residential for decades. And since 2008, the township, with an annual budget of around $750,000, has spent $400,000 defending the zoning and itself against a landowner, Aubrey McClendon (sole owner of Singapore Dunes LLC), who makes tens of thousands of dollars a day. Singapore Dunes LLC wants to build a large-scale resort complete with nine-story hotel on the property -- an unprecedented structure on the Michigan shore -- plus a 66-slip marina and a golf course. 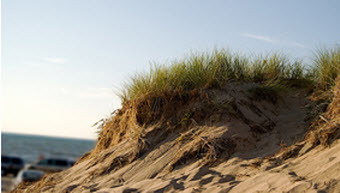 The Saugatuck Dunes (2,500 acres) lie along Lake Michigan and the Kalamazoo River. They hold the outskirts of two historical small towns, at least one ghost town, an internationally renowned art school and a host of ecological wonders. They do not look or feel quite like anywhere else -- and they are a day trip away from several major cities. Their endurance in the 21st century is something of a miracle, but it is not an accident. The communities of Saugatuck and Douglas have a long history of making choices that keep the lakeshore naturally scenic and their downtowns quaint, including the adoption in 2005 of a Tri-Community Master Plan. This proactive document simultaneously recognizes private property rights and encourages the preservation of historic and ecological treasures. Rather than following the usual local process, which would have included presenting a formal plan to the township Planning Commission, Singapore Dunes LLC filed (among other challenges) a lawsuit in U.S. District Court against Saugatuck Township. Singapore Dunes LLC also threatened the National Trust for Historic Preservation with a lawsuit after it named the Saugatuck Dunes one ofAmerica's 11 Most Endangered Places. On July 22, 2011, the beleaguered Saugatuck Township Board approved a consent decree, potentially settling the federal lawsuit by agreeing to terms thatgo beyond what was asked for in the original complaint -- and which effectively rezones all township land owned by Singapore Dunes LLC. Further, the settlement would remove any real influence of the township over how that land is used under existing or future owners. The two sides are awaiting the judge's consent to their deal. The five Saugatuck commissioners backed this proposed agreement after a four-hour public hearing, during which the majority of citizens spoke in support of finding a more equitable solution. Local attorneys and others have raised serious concerns and questions. Singapore Dunes LLC v Saugatuck Township is the latest in a troubling string ofMichigancases involving the use of consent decrees (state and federal) to over-ride locally determined zoning. Unless the state ofMichigantakes immediate, meaningful action, it will not be the last. The fate of a Pure Michigan treasure is at stake -- and so are the fates of other Pure Michigan places, not to mention participatory democracy. The locals are bearing the immediate financial and emotional burden, but every single citizen ofMichigan, especially anyone whose community is small and includes a natural or historical treasure, has a stake in the outcome of this litigation. If Singapore Dunes LLC carries the day, how long before another person with deep pockets decides to transform one of Michigan's scenic treasures, no matter what the people of the community might have planned and zoned for? Alison Swan's book, "Fresh Water: Women Writing on the Great Lakes" was named a Library of Michigan Notable Book. She teaches in the Environmental Studies Program at Western Michigan University. Ms. Swan makes a lot of very strong points in this piece. This is not just about one town in one corner of Michigan. This is about communities all around the state and all around the country who will be effected by this decision. The Saugatuck dunes area is a special place and one worth fighting for. However, the precedent that this particular case and place might well set is not insignificant. When a case leap frogs local jurisdiction and ignores local zoning and suddenly a small community finds itself in federal court, there is something very wrong. What Mcclendon has done to the township supervisors and the community is very wrong. What the courts could do by legitimizing this process is worse. People all over the state and country should be outraged by this one. Walk away Aubrey McClendon .... can't you see,,, you are not wanted here. Leave the simplicity of this place to us ! Your money means nothing here. Please just leave us be ! We love this area JUST THE WAY IT IS! There are also moral aspects to this case. I feel it needs mentioning that McClendon outbid numerous local conservation groups and citizens organizations that had offered just $1M less than his ~$39.3M purchase price a year or so prior to that eventual purchase, this after decades of focused effort to obtain and preserve that property for the public. The property's previous owner, Franklin Denison, offered a substantial section free to the Michigan DNR and said he would sell them the balance at a very attractive price. Unfortunately, the property was embroiled in a legal snakes nest (is that redundant?) and Denison died before any deal was arrived at. What kind of person calmly outbids decades of local attempts to acquire an absolutely unique property for preservation and public use, against the wishes of entire communities, simply to further his millions? The old definition is that capitalism is rule by the owners of capital, i.e. plutocracy. A newer definition equates capitalism with a free market. It's important to know how each source uses the term and whether the source slips the two meanings together. Of course the present economic system is capitalism, and it is not a free market.